Portrait of Mark Diaz Truman. 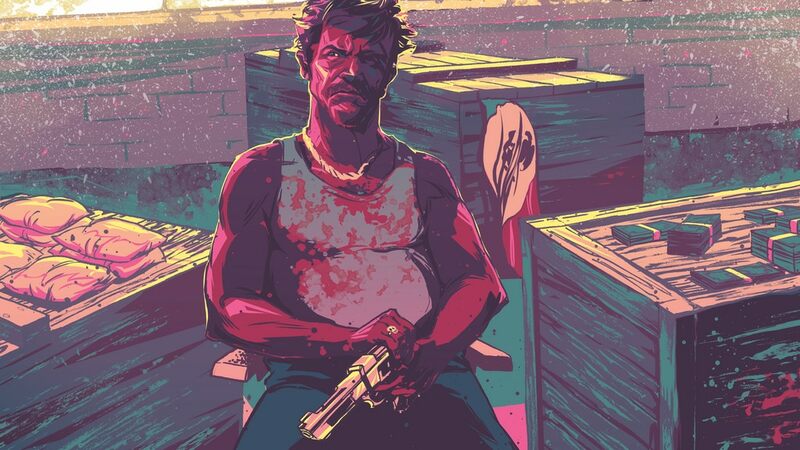 Note: Mexican gamers have messaged me to say that this game is offensive and glorifies murder and the drug trade. I'm following up on it and apologize for not researching better - I'm sorry. The interview is staying up for now, but with this disclaimer. 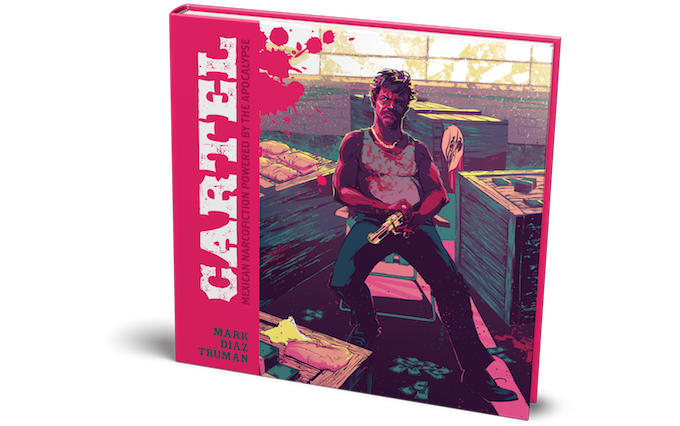 Today's interview is with Mark Diaz Truman from Magpie Games, here to talk about Cartel, which is currently on Kickstarter! Cartel is a game about Mexico's Sinaloa Cartel, in the complicated moral environment of the drug war. Check out Mark's responses to my questions! Mexican man holding a large gun, surrounded by crates of drugs. Illustration by Andrew Thompson. Tell me a little about Cartel. What excites you about it? Cartel is a tabletop roleplaying game in which players portray bold narcos, naïve spouses, and dirty cops caught up the drama and violence of Mexico's Sinaloa Cartel, trying to survive in a dangerous game of narcotics, money, and power. Cartel invokes crime fiction like Breaking Bad, The Wire, and El Mariachi, stories about ordinary people caught up in socioeconomic and cultural systems that push them to desperate places. There are no heroes in Cartel... but perhaps there aren't any villains either. Either way, Cartel creates stories that are alternately tragic and darkly humorous, set against the backdrop of an eternal drug war. 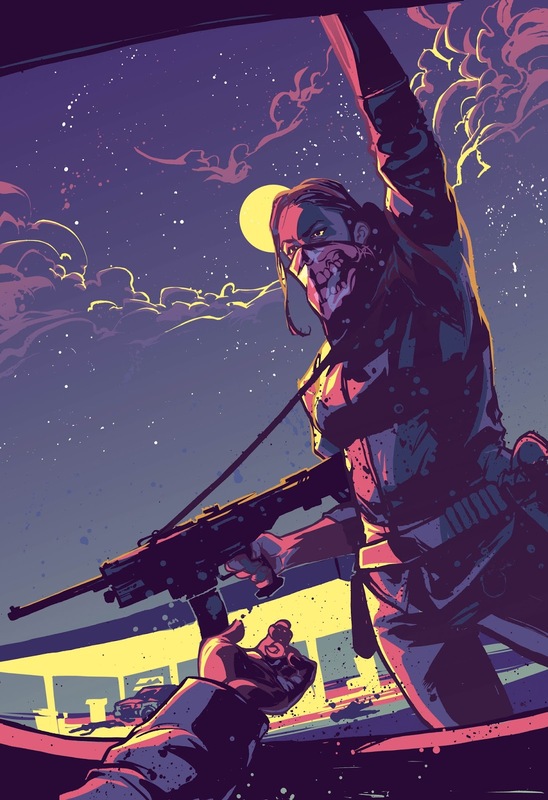 I am excited to publish Cartel for so many reasons, but chief among them is the way that Cartel connects my love of crime fiction to my own heritage as a Mexican-America game designer. After a few years of designing games, I started having conversations with people in the community about representation. 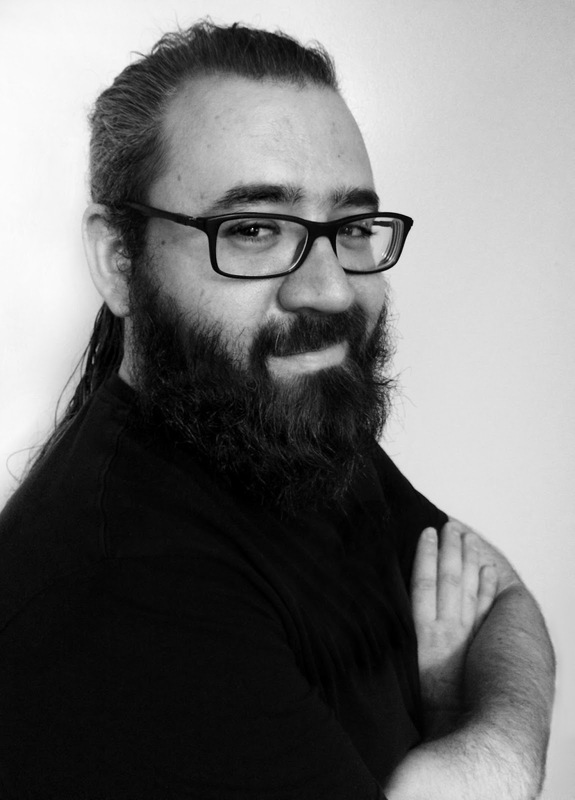 And as a Mexican-American designer, I had a terrifying thought: no one could look at my games and know anything about my life or my history or my family. I immediately had another disheartening thought: I have no idea what a Mexican-American game looks like. Years later, while watching Breaking Bad, I finally got an idea: I wanted to write a game about the drug war from the people who really live inside of it. My people. Mexicans who wake up every day in what is effectively occupied territory, caught in the middle of the war between the law and the cartels. There are many Mexican stories to be told, but this is the one that spoke to me, that unified my love of tight, compelling mechanics with the kind of fiction I loved to watch and read. But it's also terrifying. Since there are so few "Mexican" games published within our community, Cartel has to do a lot of heavy lifting. I've spent the last three years honing the mechanics and experience, and I'm so proud now that it delivers both on the cultural experience I knew was possible and a gaming experience that I hope keeps folks coming back again and again. Rear cover of the special edition book with a colorfully illustrated sugar skill on it. Coloring by Brooke Carnevale, Layout by Miguel Ángel Espinoza. 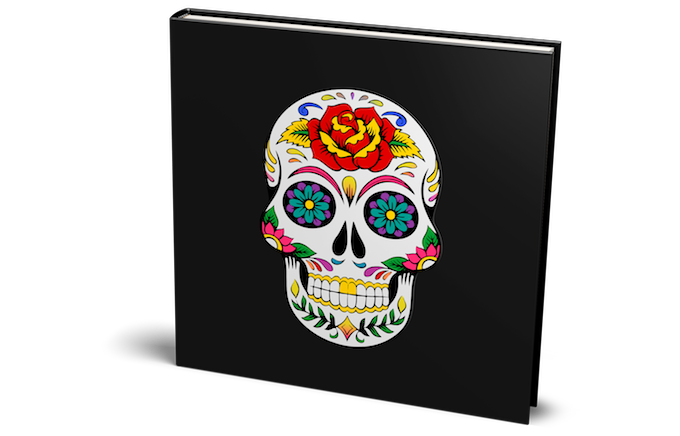 Considering your heritage and background, how have you approached writing those of native Mexican heritage, and intersecting identities like women, queer people, and biracial people? Class would also be pretty significant here, so I'm curious as well how you handled that. For the most part, Cartel is about Mexican people, not Mexican- Americans. But those lines are blurry for Latinos. After all, the border crossed us. In my home state of New Mexico, for example, the land was colonized by the Spanish before it was annexed by the Americans. Who cares what borders the gringos try to put on us? But... I also have to recognize my distance from the reality. I live in Albuquerque: 850 miles and a whole country away from Durango, MX, the setting for Cartel. Many people there live with the threat of narcoviolence every day, and I can't expect to really understand their reality from reading a few books. I can do my research and know my own history, but I've needed help from folks like Miguel to get the details right. For example, the first draft of Cartel gave a large role to the local police... which I have since learned is pretty far off from how the world really works. Issues like queerness and race are even more complicated once you cross the border. Much of my game is about class, the ways that your financial reality determines your available options, but I've tried to create room for folks to bring a variety of characters to the table to engage the systems. Ironically, the cartels can be very egalitarian; they don't care if you're gay or a woman if you're effective at your job! 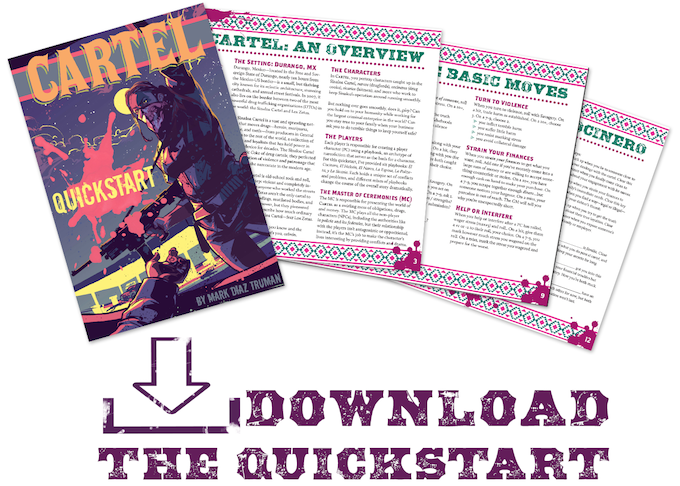 Image advertising the Cartel Quick Start, which can be downloaded here. A game focused on drugs and the associated traumas like violence and oppression is pretty intense. How do you handle those topics in Cartel? Do you use any safety mechanics to support exploration of those aspects? In the full text, I plan to provide GM's tools for working with safety at the table, ranging from how to have the first discussion to example safety mechanisms like the X-Card, etc. That said, I believe that those mechanics are primarily external to the game itself. Each group needs to figure out what is required for them to feel comfortable with the material, and that line is going to change a lot from group to group. I've found that it's really hard for me to tell folks where that line should be. That said, I've done a lot to structure the experience within the game's mechanics, sometimes in really subtle ways. La Sicaria (The Enforcer), for example, is a character that I've spent a lot of time shaping to produce a specific experience. One major change to that playbook I made early in development was to make her a retired enforcer who came back to the game after some absence, adding some world-weary priming for anyone who picked up the character. That's helped to structure the fiction in productive ways--way fewer psychokiller sicarias!--without limiting what any player brings to the table. Character playbooks with stylized layout and illustrations, with La Sicaria in front. Illustrations by Mirco Pagnessi, Layout by Mark Diaz Truman and Miguel Ángel Espinoza. What are the mechanical bits that you think express Cartel's narrative and the unique experience of the game? I think there are three main places that Cartel is expressed through the mechanics: basic moves, stress moves, and playbooks. The basic moves in Cartel work like any other Powered by the Apocalypse game, but they put a heavy emphasis on the conversation the players are having. There are four separate moves dedicated exclusively to talking or texting (pressure someone, justify yourself, get the truth, make an offer) and several others (size someone up, press your luck) that can be triggered verbally. That makes Cartel a game about conversations in the same way that Pulp Fiction is a movie about conversations: there is violence, but the camera lingers far longer on a good argument. Stress moves invoke the entire stress engine, the bloody, beating heart of Cartel. Essentially, each player character in Cartel marks stress to avoid problems or keep themselves together in difficult situations. Eventually, that stress builds...and need to be released. It's possible to just lose yourself in a substance to get through the day, but you might find yourself verbally abusing or shaming someone you care about or dishing out a beatdown to someone in a weaker position.Or if things get really bad... you'll end up confessing your sins to a priest, cabrón. Finally, the playbooks themselves contain a ton of Mexican culture and narrative that each playbook brings to the table. El Halcón has a pandilla (a crew), that comes along with him on odd jobs for the cartel, sort of like Badger and Skinny Pete followed Jesse around. The specific structure of that crew, their features and problems, is absolutely Mexican, rooted in the kinds of close relationships that exist between folks who work the street-level drug trade. I consider each playbook to be a challenge: how can I add a new facet of Mexico to the game with this character? Cartel cover with large white text on the left, vertically arranged, over the bright pink colored cover. The picture of the Mexican man with the large gun and crates of drugs is the cover image. Illustration by Andrew Thompson, Layout by Miguel Ángel Espinoza. How does the design of Cartel address challenging subjects - things like race, gender, and intersections of communities and cultures? I'm honestly skeptical sometimes of my own ability to interrogate my games: I think a lot about what I'm trying to do, but it's hard to simultaneously play the violin and say what playing the violin is supposed to mean! My hope is that, at some level, Cartel asks more questions than it answers about race, gender, and culture. Certainly Reddit threads like this one are a great start to the conversation about what games like Cartel are supposed to accomplish. But I also think that Cartel issues a fundamental challenge to the gaming industry through its mere existence: it forces a mostly white audience to consider what it means to be Mexican, without the distance of metaphor or time. In many ways, my game design has been an effort to live up to that challenge, to take seriously the idea that white folks who might not have close relationships with Mexican people might sit down and play through a few days in their lives, not as a joke or a farce...but as a compelling drama. I think Cartel makes some white folks uncomfortable because it makes them realize how alien the experiences of their fellow humans can be, that they are more comfortable playing orcs than they are people of color. I absolutely see Cartel in the tradition of indie games that includes Steal Away Jordan, Dog Eat Dog, and Monsterhearts, works that strove to expand what's considered "normal" in our spaces by demanding that the narratives of the oppressed be given some time in the spotlight. A woman holding a serious firearm looking into the trunk of a vehicle, from which someone's arm is extended, by Andrew Thompson. Thank you so much to Mark for the interview! I hope you all got a kick out of the interview and that you'll check out the Cartel Kickstarter today! P.S:Some updates made at 12:03pm on 3/20/18 to correct the names of the artists in the subtitles. Very sorry to Brooke Carnevale, Miguel Ángel Espinoza, Mirco Pagnessi, Andrew Thompson, and Mark Diaz Truman for my errors - it sounds ridiculous but I'm new to doing proper subtitling. I apologize. Behrend Bernhard, Esq. on Itch.io!